the pair of hardened forewings of certain insects, as beetles, forming a protective covering for the posterior or flight wings. These wing coverings are not painted in any way. The gorgeous color is completely natural of the magnificent Jewel beetles. These beetles have a life span of only a few days and at the end of this life they shed their elytra, providing me with these wonderful burst of color for my jewelry. 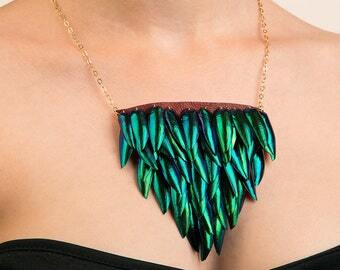 This necklace is a great statement piece and can be worn with all kinds of outfits. 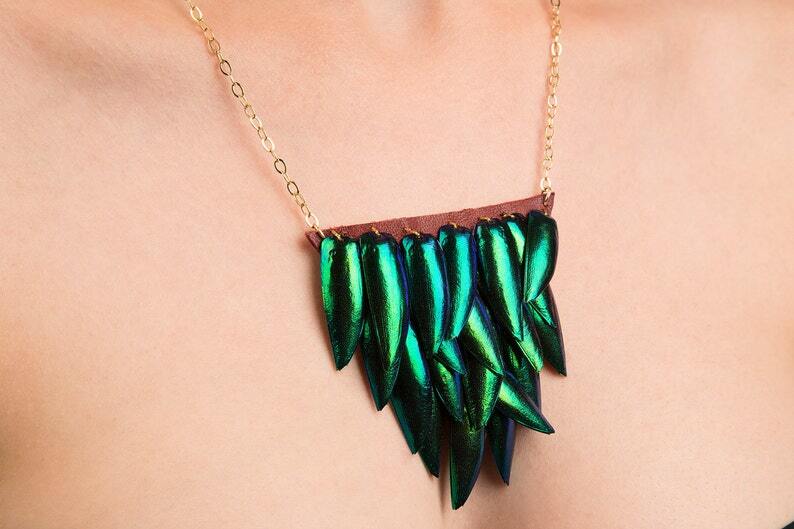 Spice up any day with this vibrant necklace. 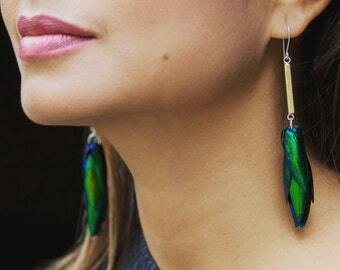 They are light and easy to wear. The wings even make a lovely sound when they move! The wings are sewn onto the burgundy lambskin and is backed with more lambskin so it is very comfortable to wear. The chain and clasp are gold plated. This necklace is for the bold at heart. Necklaces are packaged in a white padded box, wrapped with a bow, and either shipped in a white padded envelope or box depending on country of shipment. Please read my shop policies before purchase. All pieces will be wrapped in holiday appropriate paper. Please indicate the holiday or event you are celebrating and I'l try to change it up for you! Just what I ordered, beautiful!!!!! 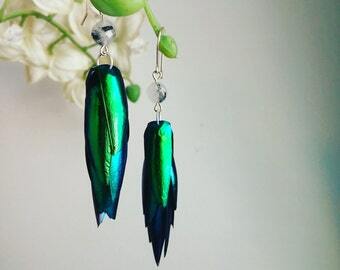 Catie has always made stunning pieces for me, including a pair of her famous beetlewing earrings, which always earn me compliments, and my wedding ring. But she outdid herself this time when she created three necklaces as a memorial for my sister in law, whose daughter passed away at 34 weeks gestation. The butterflies and angel wing will be worn by my sister in law, her husband, and her older daughter. They represent such a sweet and hopeful remembrance, keeping their sweet little girl close to their hearts even though she cannot be in their arms. The piece us really beautiful. The chains between the pieces are a little long so it makes them hard to wear across the forehead as shown in the picture, so that is a little disappointing. I may try to shorten those chains myself to fit my head. Direct deposit, Paypal and Etsy Giftcards are accepted. Personal checks are no longer accepted because processing and postage of the check take too long and things can be lost in the mail. All purchases must be paid in full before the item is shipped. There is a one week grace period for cancellations. Once an item is shipped, an order cannot be cancelled. All orders shipped within South Carolina will be charged sales tax. I do not give refunds, however I will exchange an item for equal or lesser value for free. I'll even pay for shipping you your new piece. Shipping of the returned item is the responsibility of the buyer. I ensure the quality of my products, this means that I will gladly repair normal wear and tear of any item. Products that have been misused will be repaired for a fee, depending on the severity. Shipping to me is the responsibility of the buyer, however I will ship it back free of charge. USPS priority mail will be the preferred method of shipment, unless otherwise noted in the comments section. All items are insured at value. For International shipments: All duty, import charges and other fees associated with your country are the sole responsibility of the buyer. Catie Curran Designs will not refund shipping charges, duty, or import charges if item is returned. Since I have 100% control over each piece, if you aren't 100% obsessed with how a piece looks, please message me and I can make those changes until you are satisfied! Custom work will have one free design change. After I start working, especially on things that are to be cast, I cannot change the design without charging a fee. Beetle wings are fragile. They will withstand normal wear though. 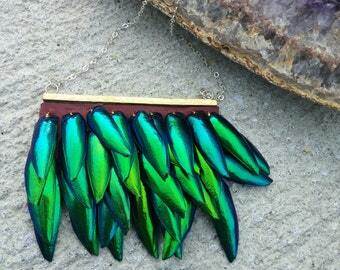 For necklaces that have sewn beetle wings on, the wings are all backed with resin. Be careful not to get leather pieces wet. 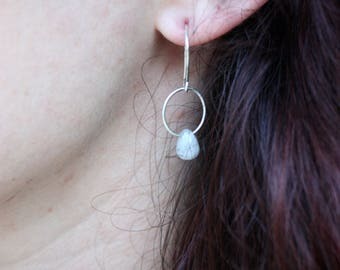 For metal jewelry, tarnish can be removed with store bought tarnish remover. I do have gift wrapping available for free. Please message me if you would like to include it with your order. If you are shipping a gift to a friend please let me know in the comments what type of message to include with the gift. Are those real beetle wings? Yes! They are taxidermy forewings of the Jewel beetle native to Thailand. How many beetles did you have to kill to get all of those wings and where do you find them? 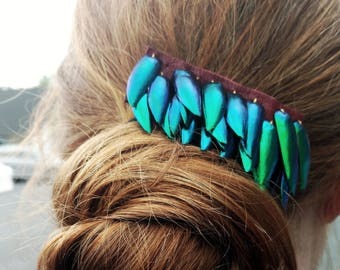 I did not personally kill a single beetle in the making of your jewelry! Jewel beetles only have a four day lifespan and once they die they shed their wings. They are harvested in Thailand. Tarsi Shoulder Necklace and Headpiece. 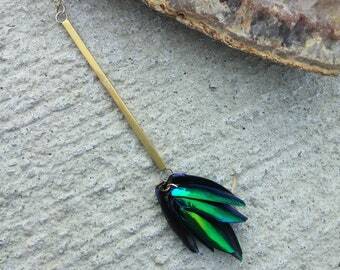 Beetle Wing Jewelry with Gold Filled Sterling Silver Chain. 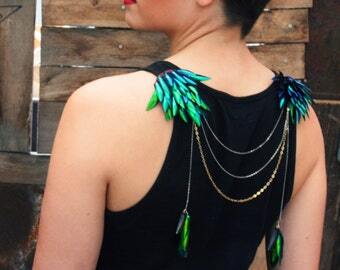 Fantasy Cosplay Costume Shoulder Piece. Beetle Etched Brass Cuff Bracelets. Adjustable cuff with etched beetles.